Are you always on the lookout for great lawn games to enjoy with your family and friends? Kubb is the best new backyard game for kids and adults alike. It takes only minutes to learn, but Kubb is a strategy-based game that will keep the competition going for hours. So how do you play Kubb? It's not hard to learn - all you need is a surface to set up your 10 Kubbs and 1 King. Each team alternates throwing batons across the field at the opposing team's Kubbs. Your awesome throwing skills are not enough to win, though: you also need strategy because the Kubbs you successfully knock over become a line of defense. The other team must throw them across the field, set them up, and knock them over again before attacking your Kubbs. With the Kubbs in ever-changing positions, strategy is everything. Kubbs should you knock down first? Remember to defend your King because the first team to knock down the King wins! But be careful - if you knock down the other team's King BEFORE you eliminate all of their Kubbs, you lose. A simple concept with endless variations, Kubb is simple enough for children to learn but challenging enough to be the perfect outdoor college party game. Kubb can be played with anywhere from 2 to 12 players, making it great for outside family games. Endless variations on the strategy and game play will give you backyard entertainment all summer long. The portable and versatile design means that, unlike other lawn games, you can play this game on almost any surface. The simple pine wood pegs can be set up on grass, gravel, sand, snow, or concrete, and you can start playing easy or challenging yard games without hauling around bulky equipment. The lightweight pine wood construction is ideal for beginners and provides easy outdoor games for adults and kids with minimal setup. Kubb is the perfect outdoor family game to play! 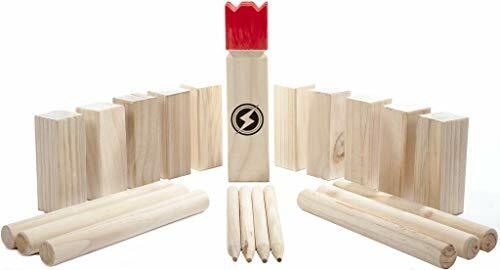 PERFECT FAMILY KUBB SET - Each Backyard Kubb Set is made of pine for easy tossing by beginning players. The simple concept and advanced strategy make it great for kids, adults, or college students. FUN OUTDOOR PARTY GAMES - Never host a boring party again! Kubb is easy to learn but challenging to master, and it offers a great outdoor time for friends and family. DEFEAT YOUR OPPONENT - You win the game by knocking down the King. But watch out - you have to eliminate the other team's Kubbs first! This strategy-based game is different every time you play. PLAY ANYWHERE - There's no need for special surfaces or heavy equipment. You can set up Kubb on grass, gravel, sand, or concrete and begin playing in minutes. Take your Kubb set to the party in the convenient carrying bag. EVERYTHING IS INCLUDED - Our Backyard Kubb Set includes everything you need to start playing: 1 King, 10 Kubbs, 6 Throwing Batons, 4 Boundary Sticks, 1 Mesh Carrying Bag, and 1 Rule Book. If you have any questions about this product by Striker Games, contact us by completing and submitting the form below. If you are looking for a specif part number, please include it with your message.